Tim Ellis is a young artist (born 1981) who is building up an impressive CV of national and international exhibitions, awards and collections, including The Saatchi Gallery, The Glenfiddich and Swiss Life. Recent group shows include ‘Flatland’ at FOLD gallery (who represent him) FOLD gallery has a fantastic stable of artists, including Dominic Beattie, another rising star. Tim was featured in The London Open at the Whitechapel Gallery and at MAC International – The MAC Belfast. Tim is appears as one of ‘100 Painters of Tomorrow’ published by Thames and Hudson. 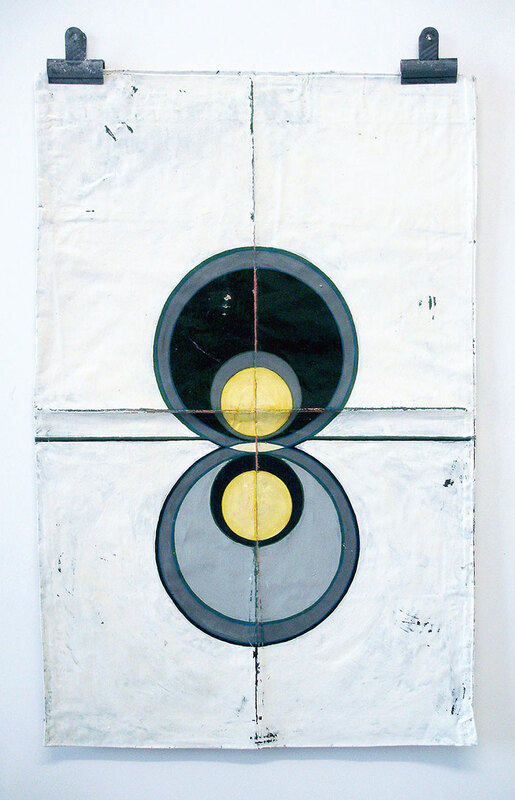 Tim is a painter and sculpture, the source imagery used is a mixture of signage and design, which is reconstructed to form symbols and motifs. The pieces mimic the appearances of flags and banners, geometric patterns within a tightly constructed framework. Tim layers the paint on linen and even pillowcases, then folds and scuffs the work creating the appearance of aging and wear. The pieces are then hung on bulldog clips lending to the effect that these are ancient textiles borne from a forgotten realm. His work in the series of ‘United in Different Guises’ appears most effective when displayed as a series, with each piece having a dialogue and interaction with its’ neighbour. The source imagery varies, from 1920’s and 30’s advertising and design magazines to artistic movements such as Art Nouveau and Art Deco. As we can see the inspiration for the work is rich and diverse, the same applies to the sculpture, which are appear to be a mix of hand made craft and prehistoric totems. As Tim states ‘I collect vast amounts of images and design motifs into a glossary for potential use…I draw my own designs inspired by them. The colours are chosen in a similar manner, worked on and changed for each painting’. Ellis has an eye for formal abstraction, with rich historical references and considered concepts. He refers to the past perhaps in a subversive manner and incorporates a new and invigorating language into painting and sculpture. Elemental and at times raw, bold in design and patterning, these pieces are visual striking with a strong aesthetic and intelligence. Here we have work that defies cultural classification and plays upon symbolism and codification. The paintings and sculpture become emblematic, they question the role of authenticity and artifice. What do these symbols mean? Where do they come from? What purpose do they have? The artist leaves the viewer guessing, which to my mind is what makes good art.